Tomorrow night at 17:40 BBC 2 will show Menace From the Deep. The Walmington-on-Sea platoon is due to relieve the regular soldiers who man the end of the pier, looking out for signs of invasion. This requires a plan and Mainwaring is happy to oblige; with Jones chipping in to supply sausages, Pike’s hundreds-and-thousands and Walker’s bottle of whiskey the platoon look set for a comfortable sojourn on the pier. Unfortunately Pike fails to tie-up the boat properly and they become stranded. Wilson’s efforts to signal to the shore result only in Warden Hodges coming out in a pedalo to give them an earful for breaking the blackout. However, his boat sinks and he too is stranded; not only stranded but drunk since he has been at Walker’s whiskey. Things get even worse the following morning when a mine drifts under the pier and threatens to blow them all sky-high; then it drifts towards the shore, threatening the safety of the Novelty Rock Emporium. The platoon try to detonate the mine safely by firing on it but their aim is wide of the mark as the warden enjoys pointing out. However, the irritating man comes good when his bowling skills enable him to detonate the mine. How they all get back to shore we never discover. This is another of the ‘seven get into trouble’ episodes, as I call them, focussing on a challenge that the platoon have to overcome, and one of the best of the crop. The episode has many similarities to Put That Light Out, from the previous series and originally screened almost exactly a year before this one: guard duty requiring a sea visit. Becoming cut-off. A perilous situation made worse by the warden and a last-minute reprieve. Walker: Godfrey was asleep on duty so I shot him. 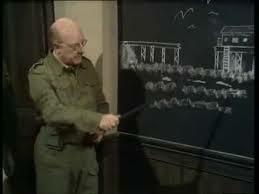 But above all it is an example of Dad’s Army pared down to its bare essentials: the platoon facing a tricky situation, made worse by outside interference, and muddling through allowing all the character conflict to play out. I’m firmly of the opinion that the series was at its very best during this, third, season, with all the essential elements in place but still young and fresh. Later casting difficulties and the problem of keeping things fresh would occasionally let an episode fall flat. But that is certainly not the case with Menace From the Deep which I rank amongst the best of all episodes. More next week when Godfrey gets branded. This entry was posted in blog on June 29, 2012 by wolAdmin.